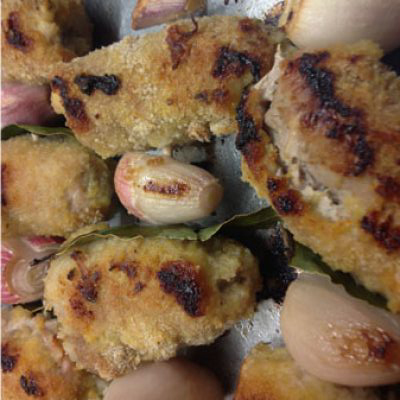 We call them olives, the Italians call them involtini and the Americans and Australians, call them braciole. Whatever hat you decide to hang on them they’re a great thing to have in the toolbox. 2Prepare the pork. Cut each steak in half and using a rolling pin, flatten the pork until the slices into thin escalopes. They should be rectangular and big enough to wrap a tablespoon of stuffing. Take care - if you over do it, the escalopes will just fall apart. 3Blitz the bread into breadcrumbs. Halve the crumbs and pour one half into a mixing bowl. Keep the remaining crumbs aside for later. 4Add the blanched bacon to the breadcrumbs in the bowl plus the finely chopped onion, sage and cheese. Add seasoning to taste and mix well. Gradually add enough olive oil so that the mixture clings together and holds well allowing you to shape it (a bit like cookie dough). Divide the breadcrumb mixture into 8. You want to allow about 1 tablespoon of mixture per involtini. 5Place 1 tablespoon of mixture at the end of a pork escalope. Carefully roll up, folding in the sides as you go to completely seal in to stop the filling escaping when cooking. Repeat with remaining five escalopes. 6Have 2 plates to hand. On one plate add the reserved breadcrumbs. On another plate add 2 to 3 tablespoons of vegetable oil. Dip the pork rolls first into the oil, then press into the crumbs, pressing down well to coat the meat. 7Take a flat sided metal skewer and thread two pork rolls onto the skewer, alternating with onion wedges/shallots and bay as you go. Repeat with remaining skewers. 8Place the skewers onto a baking tray lined with baking parchment. 9Preheat the oven to 180 C / Gas 4. Place the baking tray in the oven and cook the involtini for 25 to 30 minutes, or until cooked and the crumbs have a nice colouring. Turn 1/2 way through cooking time.